Alibaba’s (NYSE:BABA) stock has almost doubled since the beginning of the year. While this is significant even for a smaller firm, it’s even more impressive when a 95% increase in stock price adds over $210 billion to a company’s market capitalization in just about 8 months. Alibaba has been one of the fastest growing large-cap companies this year due to a sustained period of solid growth across business segments. In addition to some key acquisitions (Youku Tudou and Lazada) which the company completed last year, Alibaba has also reported strong growth metrics for its core businesses and other new ventures. Alibaba’s forays into multiple markets have had a positive impact for its business, which ultimately led its stock price to rally this year. Alibaba’s stock was trading at less than $90 at the beginning of the year before increasing to $125 by June. Following the company’s announcement to increase stake its in Lazada, Alibaba’s stock price jumped from $125 to $142. Subsequently, a strong set of Q1 FY’18 results and robust guidance for FY’18 led Alibaba’s stock price to further increase over $170. We have a revised $136 price estimate for Alibaba, which is around 20% lower than the current market price. 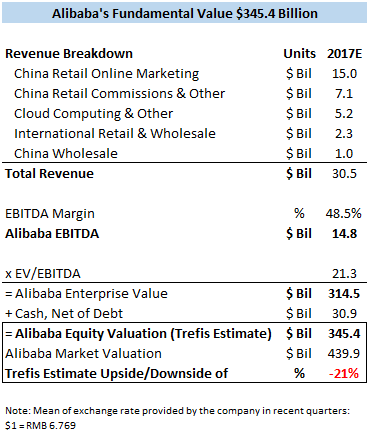 As shown in the table below, Alibaba has reported solid double digit revenue growth across all segments this year. The company reported a massive 49% revenue growth in the domestic commerce business (retail and wholesale combined) through the first half of the year, despite the huge base factor in the comparable prior year period. Similarly, its cloud computing continues to surge at a rapid pace. Although thedigital media & entertainment and international commerce segments were boosted by Youku Tudou and Lazada acquisitions, respectively, the company reported low double digit y-o-y growth even on an organic basis. Moreover, Alibaba has made significant investments including a movie production company, a payment gateway, a car technology startup and a couple of supermarket chains (Sanjang Shopping and Lianhua) in the last year to help drive future inorganic growth. Last month, the company unveiled the Tmall Genie X1 Voice-Activated Speaker, a competing product to Amazon’s (NASDAQ:AMZN) Echo. Alibaba’s core e-commerce business in China continues to be a strong performing stream for the company. Revenues in the segment have grown due to an increase in the total number of buyers as well as the average spend per buyer. The increase in the number of buyers is attributable to the increasing smartphone and internet penetration in China, with many retail purchases happening through Alibaba’s smartphone apps for websites Taobao and Tmall. The total number of mobile MAUs (monthly active users) was up to 529 million users by the end of June, which means that it still has enough room to improve given China’s huge population. Similarly, Alibaba has reported nearly a 100% annual increase in cloud computing driven by a high double digit increase in the total number of paying customers for cloud computing and internet infrastructure offerings. The total number of paying cloud computing customers surpassed 1 million in the June quarter, up from around 580,000 last year and 750,000 customers at the beginning of this year. This number is expected to increase given the huge demand for internet infrastructure across China and other Asian markets. 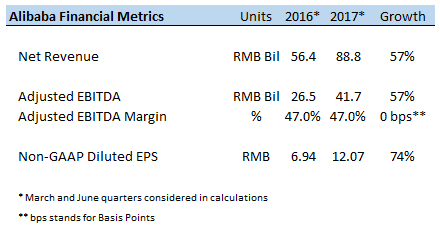 In terms of profits, Alibaba’s adjusted EBITDA has grown at the same pace as revenue growth through the first half of the year. However, the company reported a 350 basis points improvement in operating margin in the June quarter. Moreover, margins of its loss-making divisions, including cloud computing and innovation initiatives, also improved in the most recent quarter. While these segments continue to be loss making segments for now, they can become profitable over the next couple of years. In the long run, the company-wide margins are likely to improve given the relatively low variable costs, due to which the company’s operating leverage will remain high. Alibaba’s management has given robust guidance for fiscal 2018, with revenues expected to increase by 45-49%. As a result, we have revised our forecasts to reflect this. Furthermore, based on Alibaba’s strong performance through the first half of the year, we now forecast the company’s adjusted EBITDA margin to be around 150 basis points higher than prior year levels at 48.5%. 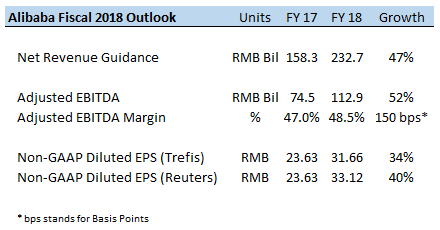 In addition, we forecast Alibaba’s non-GAAP diluted EPS for the fiscal year ended March to be 34% higher on a y-o-y basis to RMB 31.66, compared to a Reuters’ consensus estimate of RMB 33.12. Based on our revenue and EBITDA forecasts for the current calendar year, our valuation for Alibaba currently stands at $345 billion, as shown below. 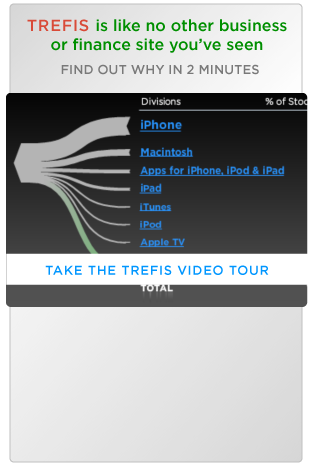 Our valuation is around 20% lower than the company’s current market capitalization. You can modify the interactive charts in this article to gauge the impact changes in individual drivers for Alibaba can have on our price estimates for the company. Visualize Related Companies: Alibaba Group , Amazon , Baidu , Alphabet Inc.